AOTA Conference Countdown: First-Time Attendee Guide – What to Do Before, During, & After Conference to Have the Best Time Ever! 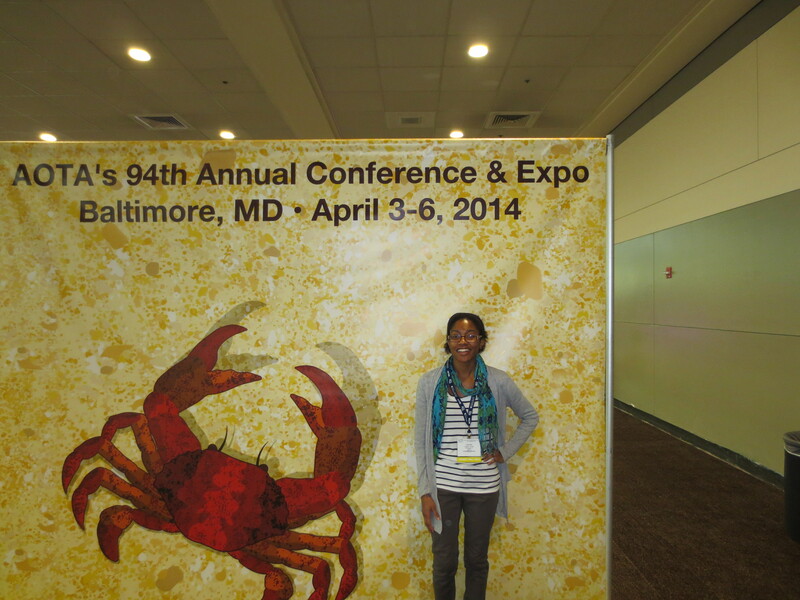 This post is part of my Conference Countdown series. Check out the other posts about missing classes for conference, networking, and planning your itinerary! 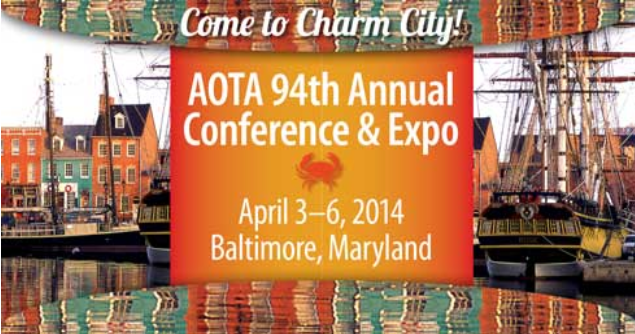 You can also read my posts from the 2014 AOTA Conference in Baltimore HERE and HERE to learn more about the conference experience. Last year was my first year attending an AOTA conference, and it was easily the highlight of my not-yet-started life as an OT! I went by myself as a volunteer, but I met and talked to so many cool people it was like I was there with a bunch of old friends! Still, going for the first time was a little intimidating, so I’ve written a guide for people who are going that haven’t been before and may not be sure what to do or expect! There’s advice for students and practitioners, and I hope you find it helpful! 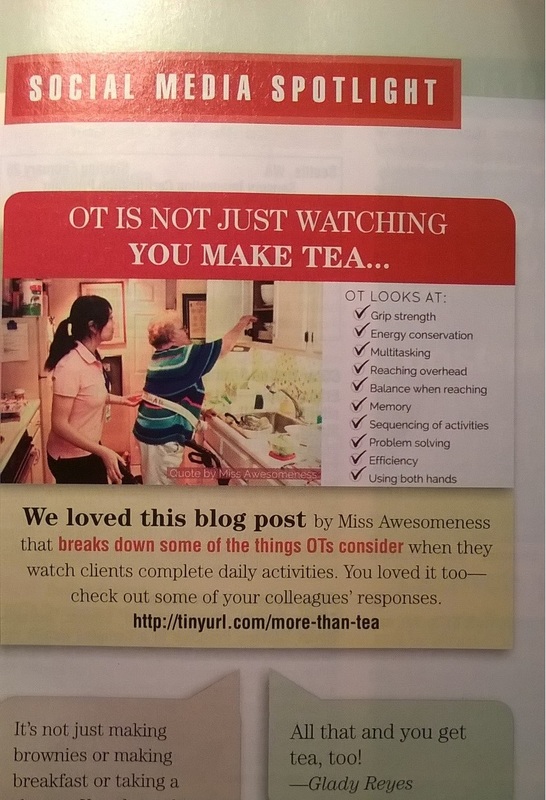 Last week I was reading the January issue of AOTA’s OT Practice magazine when I came across a little “Social Media Spotlight” shout-out about the wonderful OT Miss Awesomeness. It focused on an insightful blog post she wrote in December describing how although it may look like an OT is not doing much with a client during a therapy session, in reality he or she is thinking about a million things related to the client’s function. As Miss Awesomeness describes in her post – and as AOTA describes in a cool infographic they made after she published the post! 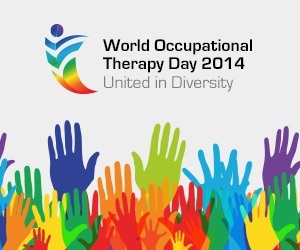 – the OT is not just relaxing as a client is cooking or doing another task. He or she is performing functional analysis and observing the environment, context, and client to determine where or if there is a breakdown that causes the client to be unsuccessful in their attempts to engage in the occupation. In her blog post, Miss Awesomeness used the example of a therapist who was observing a client making tea. During the session, he discovered that although his elderly client was able to lift four pound weights during their therapy sessions, this ability did not translate into functionality during the cooking activity. Although the woman was able to lift the weights, she was not able to lift the heavy bag of sugar from an overhead cabinet in the kitchen with one hand (the scenario in which she would be accessing the sugar in her home). For me, this was an important post to read because it helped me better understand the skill and value of what occupational therapists do while working with their clients. It was a great, well-written post, and a great example of how an OT (or OT student, as the case may be!) should always keep functionality in mind when working with clients or planning sessions. If a therapist fails to consider the context in which a client performs an occupation, he or she risks providing unhelpful interventions that will not support the client’s successful return to everyday living. It would be like an athletic trainer working with a person to help him learn how to mountain bike on a heavily wooded trail by using a stationary bike in the gym! Although there are some similarities between the two scenarios, it would make much more sense for the trainer to observe the client in the trail setting and make recommendations based on how they performed there, right? As I continue to complete my Fieldwork I and see more therapists at work, I can apply knowledge like this to what I am seeing. Although I am always trying to consider how the different tools in an OT’s tool belt are used for treatment, I will also keep in mind the importance of using these tools in a setting and context that is most helpful for the client!